As you guys know, I’m not really into recipes that take longer than about 15 minutes to prepare. I finally hit the grocery store for provisions last night, but yesterday at lunch time I was staring into our (almost empty) fridge and spied some sweet potatoes. In the cabinet, we had black beans and quinoa. 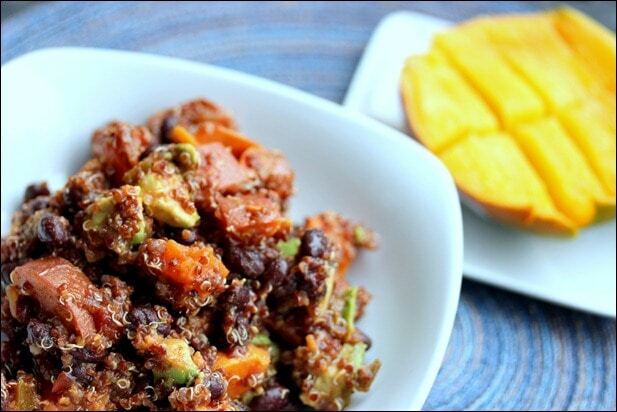 And thus this simple and easy recipe was born: Sweet Potato Black Bean Quinoa Salad. I found a few recipes using the ingredients online, but all of them called for roasting, or sautéing, or various other things I really didn’t feel like doing for a simple lunch. So instead, I decided to make this recipe the easiest thing ever. You do have to cook the quinoa on the stove (unless you have some pre-cooked on hand), but everything else can be done with just a microwave! Cook the quinoa per package instructions. I used 1/2 cup dry quinoa. Cook the sweet potatoes in the microwave. Simply poke a few holes in it with a fork and pop it in the microwave on a damp paper towel. Cook about 4 to 5 minutes for one potato, adding 2 to 3 minutes per extra potato. (I used two small potatoes.) Once cooked, slice into cubes. Keep the skin or not – up to you. Just make sure it was washed well if you keep the skin! 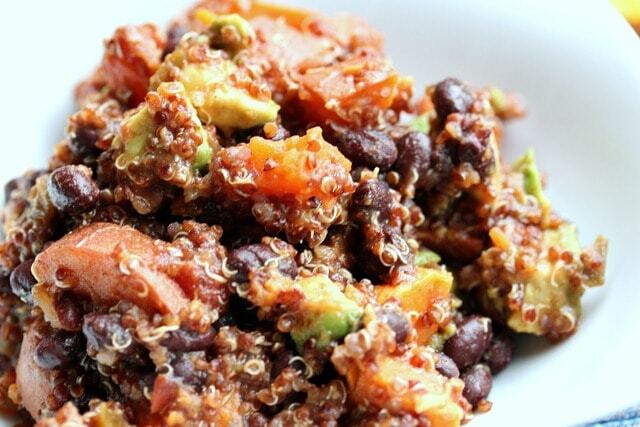 In a large bowl, mix cooked quinoa and cubed sweet potatoes. Add avocado, sliced (I used 1 whole avocado). Add the rinsed/drained black beans (I used one 14 oz can). Top the mixture with salsa (as much as you like! ), plus a few shakes of cumin, chili powder or red pepper, and black pepper. Top with hot sauce if desired. Enjoy! Told you it was easy! Nutritious, too – you’ve got fiber from the sweet potato and black beans, protein from the black beans and quinoa, and healthy fat from the avocado. If you wanted to add even more nutrients, serve it on top of a plate of wilted spinach or salad greens! Love the sweet potato and black bean combo? Here is another recipe you will love: Sweet Potato & Black Bean Veggie Enchiladas. What’s the best quick and easy meal you’ve made for yourself lately? Perfect combination! All of my favourites in one; though I’m on a millet kick lately! YUM! that looks incredible and super easy!! Love this idea….it’s all of my favorite foods combined!! thank you for this! recipes like this are exactly what my patients need to eating more plant based meals super simple and super easy! Yum! Sweet potatoes and black beans are two of my favorite go-to ingredients. I always try to have some on hand and they seem like they go pretty well together. This would be an easy enough recipe to follow for a workday lunch too. The thing is… I have been craving ALL of the ingredients in this salad. Well, quinoa not so much but I have been meaning to make something new with it. 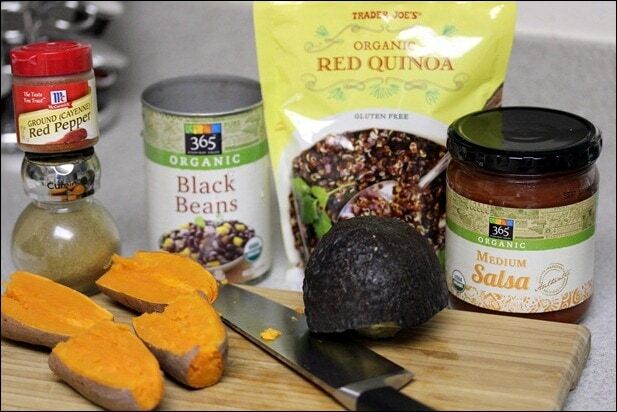 But avocado, black beans, and sweet potatoes – total craving. I was wondering how long this would keep in the fridge, do you think? I cook for one. OMG- seeing this post just made me feel so much better. I used almost these exact ingredients for dinner last night, only I put the potatoes, beans & salsa in a whole wheat wrap for a quasailla of sorts. I loved it- my husband hated it. I was beginning to think I was a weirdo for combining these ingredients! This would have been a good recipe for my what I wish I ate Wednesday!! looks great. I saw this recipe post this morning and knew I had all of the ingredients (minus the avocado) at home so I whipped it up for easy grab and go food for me and my husband this week. I subbed Rotel for the salsa (didn’t have any on hand) and use left over roasted sweet potatoes ( awesome use for them!). He walked in the minute I finished it and ate a big bowl of it- awesome idea. I’ll be making this again! Sometimes I get too caught up in measurements and trying to follow a recipe exactly so I get it just right, but eye-balling it seems easier so I can add more of what I love :D Great idea! It’s my preferred method of cooking. :) More fun! oh yummmm <3 thanks, Anne for the recipe! That’s my kind of recipe! I don’t really measure either, makes life easier. I know what to do with some of the sweet potatoes I have here at home now. Thanks for sharing this salad recipe. Yummy! I gave your name to the 1 Fit Widow group. Lorrie said she talked to you and will post your recipes on their new web site! Yum this looks great. I’d have to make it sans black beans as I can’t eat legumes but love the flavour combo. This looks great! And I have all of the ingredients! I love how melty avocado gets when it’s paired with quinoa… Bet this would be great as a wrap filling too! Looked yummy!! Sweet potatoes and black beans are just such a great combination. I made sweet potato, black bean, and kale quesadillas a while back and they were fantastic! Yum! I love leftovers as well! So easy the next day! The easiest meal I have made would have been the brown rice pasta with spinach and chicken. I grilled the chicken on the George Foreman and just sautéed the spinach really quick. It took about 15 minutes and turned out amazing! I love this. Added lime juice for a great tang! 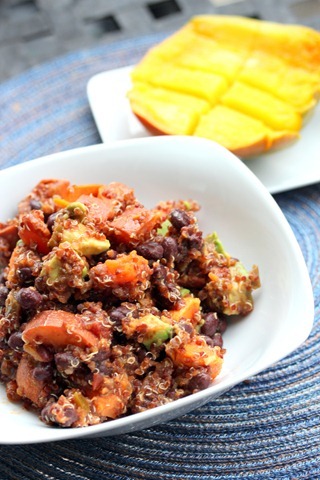 I cooked one sweet potato, one can of black beans, one avocado, one cup of cooked quinoa, 1/2 jar of salsa, and added 1/8-1/4 cup lime juice (YUM!!! ), 1/8 cup olive oil, 1 minced clove of garlic, sprinkle of red pepper flakes. I mixed the wet ingredients like a dressing and stirred it all up. Took 10 minutes to make, no leftovers since my husband (who hates sweet potato usually) and I ate up the whole thing in less than 10 minutes. The lime juice makes it so fresh tasting. Healthy, fast, and delicious. Absolutely a winner! Thanks for the great idea. Love the idea to add lime juice!